How often do you play video games? Gaming enthusiasts can testify in truth that regular gaming headphones do not always feel comfortable, especially when used continuously for long hours. The phones tend to get hot as well as feeling heavy on one’s ears. Moreover, the ear cups, especially those that are fitted with leather padding, are not very well breathable. This makes long hours of gaming uncomfortable, and it pisses some people off. You want to keep this load off for a while and still continue enjoying your game? Gaming earbuds are a sensible solution to those who want to give their ears some relief. Gaming earbuds are an ultra-compact, lightweight and easily portable style of earphones designed to fit directly into the ear canal. There are earbuds that are specifically designed for gamers. Similar to gaming headphones, the gaming earbuds are designed to produce high-fidelity audio that is immersive enough to drive you deeper into the game. What is the essence of having earbuds specifically designed for gamers? Why can’t I just wear the ones use with my iPod? One thing you should realize is that those iPod earbuds were designed for music and can fail to accurately tune to the sound effects of the game. There are certain effects that game designers incorporate into the game, which must be felt for one to get the excitement and full experience of the game. For one to enjoy the gameplay, the sound effects and other sounds such as gunfire, explosions, footsteps, car roaring, etc. should be fully enhanced. Surround sound systems and over-the-ear gaming headphones are well-known to enhance these sounds. Similarly, gaming earbuds are designed to bring out these effects though in a smaller dimension. In addition, they offer an excellent exterior noise reduction. The isolation from external noise is what amplifies the gaming audio effects. 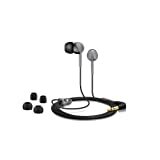 As indicated earlier, earbuds are ultra-compact and lightweight, making them highly portable. These earbuds are not something that will replace the regular gaming headphones. This is because they can’t be as good as headsets when it comes to simulating the gaming sound environments. However, owning a pair of earbuds will give you extra comfort and freedom from your headsets whenever you start feeling uncomfortable. Another feature that comes with gaming earbuds is the inline microphone. The mic is capable of picking up voice clearly as long as it’s close to the mouth. Hence, just like the over-the-ear headphones, earbuds can be used to play games that require voice commands. Earbuds are the most portable of all kinds of earphones due to their small size, lightweight, as well as being easy to conceal. You will not find them heavy or feel uncomfortable even if you wear them the whole day. Additionally, you can play your favorite games anytime and anywhere, even when you’re on the bus or train. 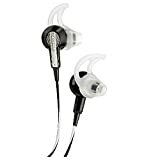 Earbuds have small size tweeters which enables them to accommodate all sounds including high and sharp sounds. This property enhances the production of quality treble. Most earbuds are well-fitting into the ear canal. This helps in blocking external noise from entering the ear canal. They are usually made from a material that exhibits sound blocking characteristics. Since not all is rosy for earbuds, below are some of the drawbacks associated with earphones in general. It’s obvious that earbuds cannot reproduce bass clearly the same way woofers and subwoofers do. 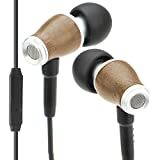 Despite this drawback, gaming earbuds are designed to reproduce high quality bass that is adequate for gaming experience. The standard size of earbuds will not fit perfectly into all ear canals. Some may feel too loose while others feel too tight. This is because all ear canals are not identical in size. So, it’s upon the users to find a pair that is perfectly fitting. With so many gaming earbuds in the market today, we decided to offer you a helping hand when it comes to choosing the best. Our aim is to see you pick the best pair of earbuds for your gaming needs. 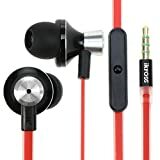 Below are top 5 picks from the most popular gaming earbuds from Amazon. The selection criteria include product’s rating, customer reviews, comfort, and quality. Some brands of earbuds could be designed for both gamers and audiophiles. However, Razer Hammerhead Pro was exclusively designed by gamers for gamers. This is because the audio output is engineered up to the requirements of gaming sound. They are made from high-grade lightweight aluminium body, which is a sign of durability. The inner acoustics chamber features an optimized design for superior quality of bass and crystal clarity of audio communications. 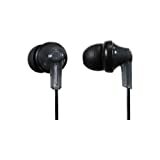 As the name suggests, the earbuds are said to be producers of hammering bass. The Razer Hammerhead Pro also features an advanced passive noise isolation mechanism. This feature is enhanced by the interchangeable ear-tips (of sizes small, medium, and large) and the optional bi-flanges. These ear-tips are also aimed at minimizing the cases of earbuds being too tight or too loose in the ear canal. They come with a carrying case to compliment the style, comfort, portability, and audio fidelity. The main con of the Razer Hammerhead Pro is that it doesn’t come with an inline volume control. Additionally, its mic is not very good at picking voice. Are you the type of gamers who prefer to leave their bulky headsets home when travelling? The Razer Moray Plus is designed for you. 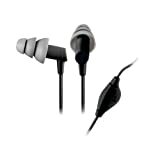 The basic package comes with in-ear earphones along with an omnidirectional inline microphone. The earphones have a passive noise isolation capability and extended bass output. 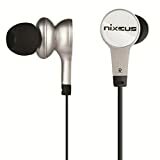 This pair of gaming earbuds has a sleek, lightweight design and produces powerful bass-driven stereo audio with superior clarity of the mid/high range. Razor Moray Plus also features 3 adapters to support both audio and voice for multiple gaming devices. In this case, it can work with PCs/laptops, Apple devices, Sony PSP 2000/3000, and Nintendo DS Lite/DSi. This makes Razor Moray + a great tool for both communication and gameplay. The SteelSeries Flux earbuds come with memory foam tips for better audio experience. The package also includes silicon ear-tips of 3 different sizes, i.e. small, medium and large. If you are a gamer who likes burning the midnight oil, these earbuds are ideal for you. This is because they are very comfortable to wear even for hours. The earphones are lightweight with flat rubber cord which lowers chances of tangling and getting messed up in your pocket. The SteelSeries Flux features an omnidirectional inline mic whose capturing of voices is pretty good. The sound captured/delivered is clear and accurate because they make use of balanced armature technology. The cable ends are swappable such that you can use it with a wide variety of devices. For instance, there is an end that can be used with mobile devices and Mac for it has a 3-pole 3.5mm jack. The other end is for usage with PCs as it has both a 3.5mm headphone jack and a 3.5mm microphone jack. SteelSeries Flux headsets are designed for wearing over the ear. The over the ear design allows for a secure fit as well as better listening experience. Finally, the package contains a carrying case to ensure protection of both the headset, extra cable, and the ear tips against damage. The Turtle Beach M1 earbuds are specially designed for gamers on the go. 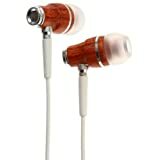 They have noise-isolating design which optimizes the quality of sound. They also have an around-the-ear design to enhance stability and comfort. These headsets are characterized by superior quality sound and high deep bass response. This is enhanced by its large 10mm drivers with neodymium magnets. For crystal clear communication, the Turtle Beach M1 features an omnidirectional inline microphone with sleek and compact design. The inline mic also enhances hands-free calling with your mobile phone. For multiple device compatibility, the M1 is fitted with a standard 3.5mm jack. Users are also provided with a carrying pouch for convenience and protection of their earphones. This was officially designed for the PlayStation Vita gamers. It’s a stylish headset whose rich audio performance and in-ear style gives you deep immersion into the game. The quality of audio enables you to hear all the action as you play. The earbuds offer impressive passive noise isolation. The headset is fitted with an integrated mic for crystal clear communications. The mic can be muted using an inline switch. The mic muting is basically done when you’re in game play and you don’t want to be heard by your enemies. This headset comes in a variety of stylish colors. The package also contains 3 sizes of silicon ear tips. The ear tips ensure a comfortable and secure fit in the ear canal. The fact that it’s the official headset for PlayStation Vita doesn’t make it incompatible with other devices. It’s fully functional and compatible with all devices that have a standard 3.55mm port. In simple terms, the earbuds work as standard headphones.